The European Parliament's chief Brexit negotiator called on EU voters to back pro-EU Liberal and Democrat parties in May’s European elections. It comes as Mrs May prepares to return to Brussels to push for concessions on the Irish backstop. And with the clock ticking on Britain’s March 29 exit from the single bloc, Mr Verhofstadt urged EU voters to reject populist parties across the continent. Mr Verhofstadt tweeted: “Europe is more united than ever before, but has also never been more threatened. “Those who do not wish to see it destroyed should support Liberals & Democrats in May! Mr Verhofstadt leads the Alliance of Liberals and Democrats for Europe Party (ALDE Party), which is made up of 60 parties. The umbrella group has 68 MEPs and five members of the European Commission. Mr Verhofstadt was commenting on an article in Spanish newspaper EL Pais which claimed support for the EU had increased. Miguel Otero Iglesias, a Senior Analyst at Real Instituto Elcano and a professor of practice at Instituto de Empresa’s School of Global and Public Affairs, wrote: “When future historians analyse the tug-of-war between the UK and the EU over Brexit, they will conclude that the Union remained united and secured a separation agreement that proved beneficial to its own interests. The EU has so far rejected all of Britain’s effort to amend the Brexit deal in order for it to get through Parliament. 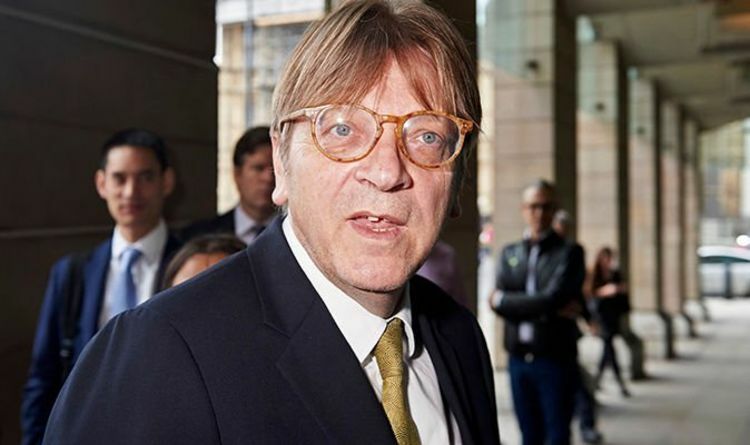 Mr Verhofstadt has dismissed the result of Mrs May’s Commons vote which saw MPs back a motion to replace the backstop with “alternative arrangements”. He said he hoped a deal is possible but warned the terms already on offer remain "the best and only deal possible". The EU’s chief Brexit also ridiculed the "lack of clarity and lack of stability" in the British position, with "teeny-tiny" majorities deciding different positions in the Commons. The European elections take place from May 23 to May 26.